Patrice Motsepe (Patrice Tlhopane Motsepe) is a South African billionaire mining magnate. He is the founder and executive chairman of African Rainbow Minerals. He was born to Augustine Motsepe (Father) and Key Motsepe (Mother). 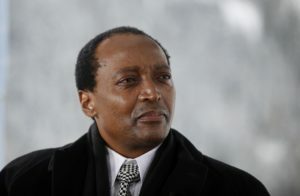 Patrice is the brother of Tshepo Motsepe and brother in law of South African President Cyril Ramaphosa. He has a Bachelor of Arts from the University of Swaziland and a Bachelor of Law from Wits University. He was born on the 28th January 1962 in Ga-Rankuwa, Pretoria, South Africa. As of 2019, he is 57 years old. Motsepe is married to Dr. Precious Moloi-Motsepe, and together they have three children. Precious is a leading businesswoman, physician, entrepreneur, and also a philanthropist in South Africa. In 2012, she was named one of the country’s Most Influential Women. Together with wife Precious Moloi, Motsepe has three children. He has three sons who are named Thlopie, Kgosi, and Kabelo Motsepe. Patrice Motsepe has an estimated net worth of 1.9 billion USD. He is one of the richest men in South Africa and is known as the richest black man in South Africa. He purchased a house in the exclusive suburb of Bishop’s court in Cape Town for R69 million in 2013. The grand home, om a plot of 12000m², first hit the market for R98 million in 2011. In 2013 the European owner needed an urgent sale and slashed the price by R20 million. Motsepe’s garage is also mouth-watering. He owns a 2007 BMW 750 iL, Mercedes Benz S65 AMG, a Bentley Continental GT, and also BMW 760 Li. He recently bought one of his children a Supercharged B7 Audi RS4 and he also owns a private jet. Gym, a music room, a cinema room, a billiard room and a 10-bay garage with a separate bay to have cars washed. House for an estate manager and the mansion has a staff wing. 2006 – Present: Non-Executive Director of Sanlam Life Insurance Limited. Present: Executive Chair, African Rainbow Minerals Ltd. Present: Non-Executive Director of Absa Bank Limited. Non-Executive Director of Barclays Africa Group Limited. 2003 – Present: Non-Executive Chair of Harmony Gold Mining Company Limited. Present: Chair of TEAL Exploration and Mining Incorporated. Present: Director of African Fashion International. 2008 he was 503rd richest person in the world, according to the Forbes World Billionaires List.